A well-fitted pair of football cleats is one of the most important pieces of equipment you can purchase as a football player. Cleats help you keep your footing, help you propel as you sprint and allow you to quickly stop, cut and change directions on the playing field. Like most shoes, football cleats may not be the most comfortable shoes upon purchase. 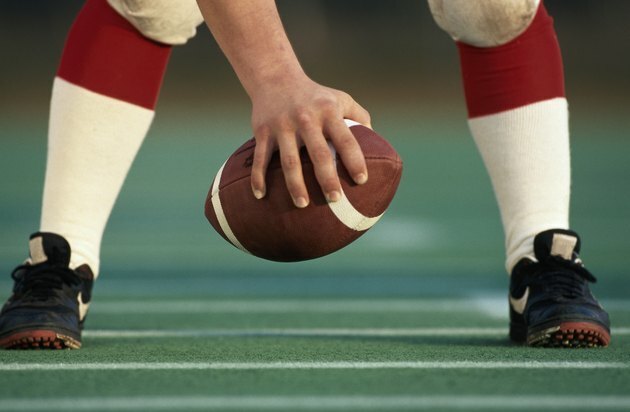 Learn the ways that you can help prepare your shoes for the upcoming football season. Endure that your football cleats are the appropriate size. Poor-fitted football cleats can lead to blisters, sores and other foot and ankle injuries. Your shoes should fit snugly in the heels with plenty of room in the toes. Your longest toe should be 1/2 inch from the tip of your shoe. Use petroleum jelly on portions of your feet that may be susceptible to blisters and sores from friction. Apply a thin layer or petroleum jelly to your toes as well as your heels to help reduce friction between your football cleats and your skin. Walk around in your new football cleats in your house, backyard or a park. This can help your feet get used to your new cleats. Gradually introduce your new football cleats to practices. Wear your new cleats for a few hours each practice until you are comfortably able to wear them all practice. Stuff your cleats with newspaper after each use. This can help to stretch the shoe and keep the shape of your shoe. Always try shoes on prior to purchase. Football cleats should fit relatively comfortably at purchase. Avoid buying shoes that seem uncomfortable from the minute you try them on. To prevent foot and ankle injuries, replace your football cleats when they become worn or damaged. If you suspect a foot or ankle injury, discontinue foot and contact your physician.